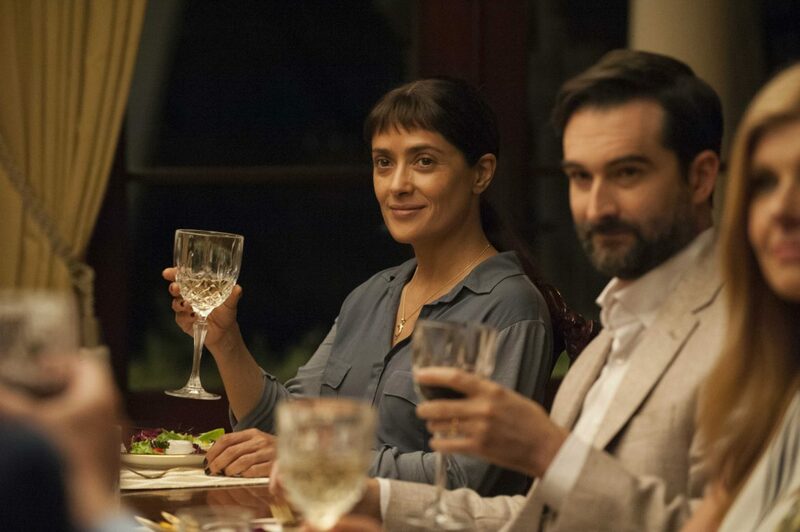 A social drama, Beatriz At Dinner sets up interesting conversational pieces but leaves them dangling. In Los Angeles, Beatriz (Salma Hayek) is a natural healer and massage therapist, working at a cancer treatment clinic. She is depressed because her pet goat was recently killed by a neighbour. One afternoon Beatriz drive to the swanky home of her client Kathy (Connie Britton) to provide a massage ahead of Kathy's small dinner party. Beatriz's car fails to restart and she is invited to stay for dinner, where the guest of honour is business tycoon Doug Strutt (John Lithgow). Beatriz and Doug immediately clash. He looks down on her immigrant roots, and she senses that he is a heartless developer with little regard for the wellbeing of the communities where he builds his hotels and shopping centres. When Beatriz learns that Doug also enjoys big-game hunting she snaps, and the evening takes a turn towards open hostility. Directed by Miguel Arteta and written by Mike White, Beatriz At Dinner fearlessly takes a seat at the table where societal divisions are laid bare. The front lines where tensions simmer between poor and rich, Hispanics and whites, recent immigrants and less recent colonialists, animal loving vegetarians and animal killing meat eaters, spiritualists and capitalists are all represented by Beatriz's reluctant invasion of Kathy's party. Doug embodies the source of all the ills Beatriz struggles daily to heal, and this is one dinner party where she will call out her demons, pleasantries be damned. Despite an intense Salma Hayek performance and a suitably smug turn by John Lithgow, the film stalls once it makes its points. Arteta and White struggle to steer the film towards a satisfying ending, and indeed they try a few different iterations on for size. Eventually Beatriz At Dinner settles for abstract visuals and pretty pictures of floating lanterns and water, where meaning is imagined rather than conveyed. The brief 83 minutes of running time betray an inability to flesh out any of the supporting characters, with Connie Britton, Chloë Sevigny, Jay Duplass, Amy Landecker and David Warshofsky sacrificed to make up the numbers and confined to the shallowest of backgrounds. Beatriz At Dinner serves up a few deliciously awkward moments of social tension, but the desert is no more than mediocre.